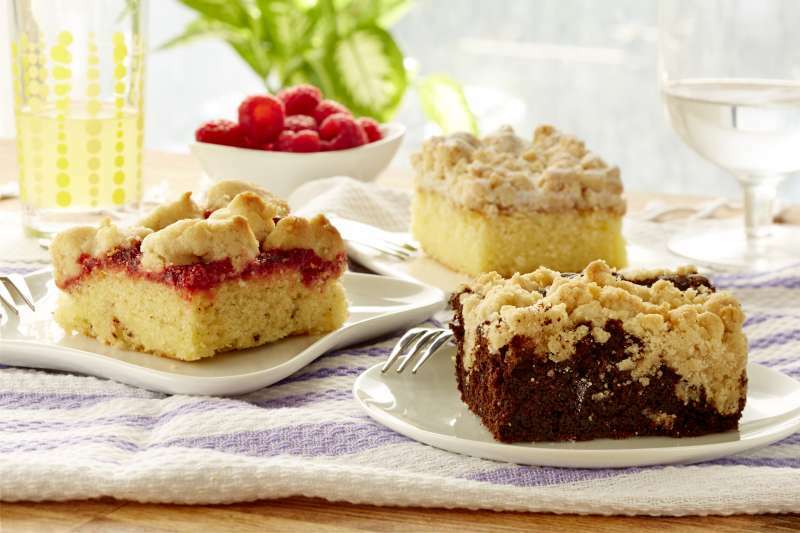 A Sampling of Four Slices Each of Our Crumb, Chocolate, and Raspberry Cakes. Over 3 1/2 pounds of our Delicious Crumb Cakes made from our Old Family Recipe and baked in a 9" by 13" sheet providing 12 slices per sheet. From Coopersheeps of DEER PARK, New York on 2/11/2019 . I love this cake but honestly the crumb on top sold it for me. I've already given it as gifts to several people and keep some at home at all times. From Buddy of GREENVILLE, South Carolina on 1/15/2019 . I've grown up with many different crumb cake recipes and this is the best! From Nancy Sevell of Boca Raton, Florida on 12/18/2018 . We have enjoyed many of the original cakes but I decided to try the variety pack and we are so glad. Absolutely delicious - chocolate cake was moist and the raspberry was just perfect. We will definitely buy this one again and will be anxious to try the apple. From Regina of Courtlandt Manor, New York on 12/16/2018 . This is the second time I bought the crumb cake as a gift. The first time I got the plain and the next time I got the variety. Both people liked it very much and thought it was delicious. From Vicki Napolitano of West Babylon, New York on 11/27/2018 . I had the dessert delivered to my house for Thanksgiving. Everyone loved it! The cake was so moist. This is my 3rd time getting this cake and I highly recommend it.